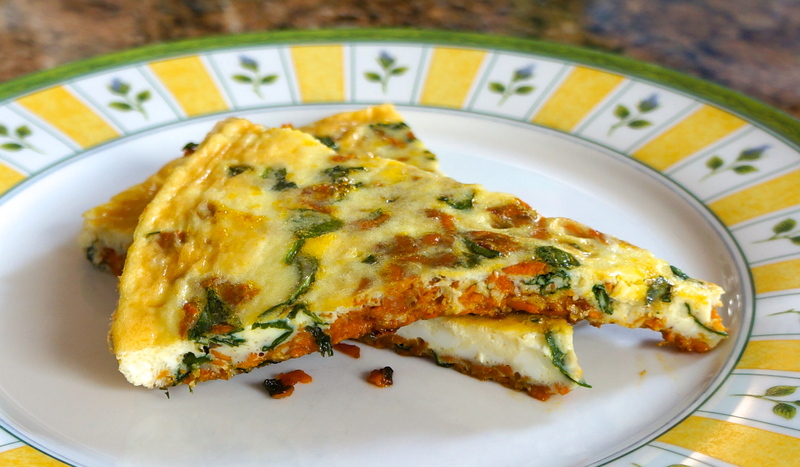 If you’re looking for an all-in-one breakfast, this one has protein from the eggs, healthy fats from both the eggs and the bacon fat (or whatever cooking fat you decide to use), some nutrient-dense carbs from the sweet potato/yam, and some great vitamins, minerals, and fiber from the spinach. I love to work vegetables into my breakfasts! 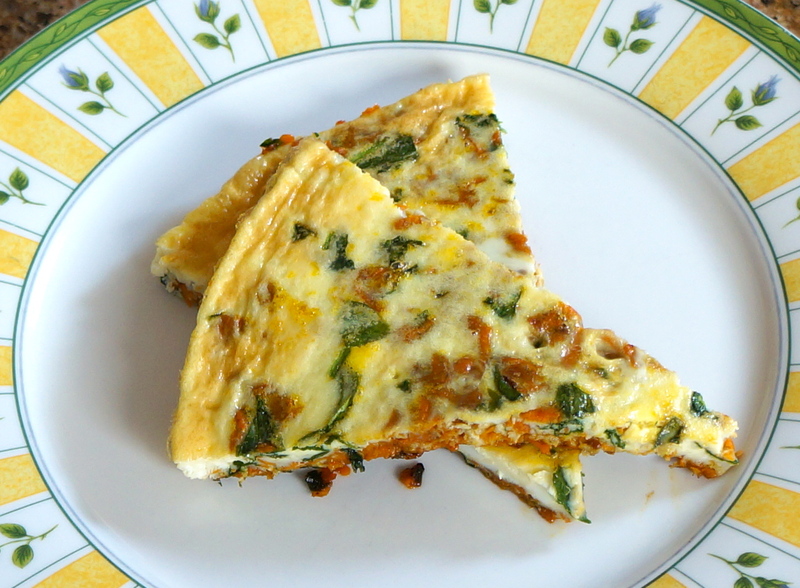 And a piece or two of this frittata will keep you satisfied for hours. 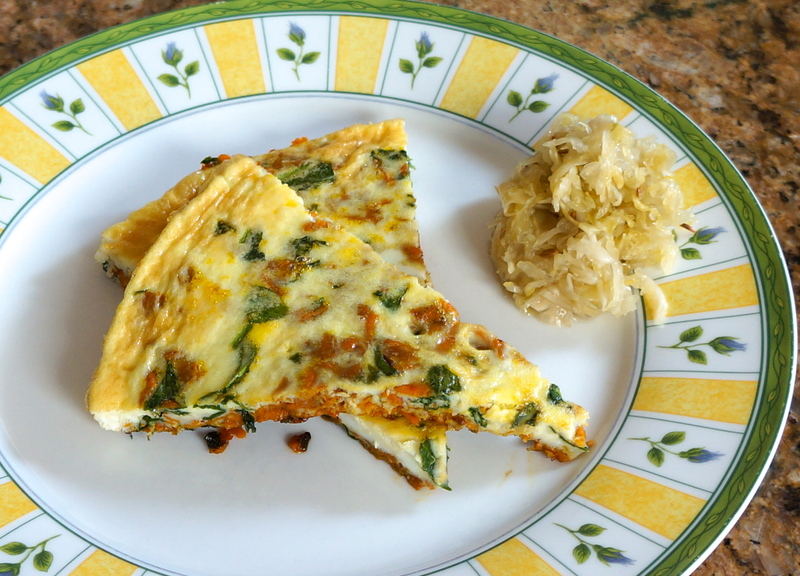 I paired my frittata with some raw sauerkraut (which gave me a dose of probiotic-rich fermented cabbage). Now that’s a super breakfast! Heat a 12-inch cast iron skillet over medium heat. Melt your cooking fat (I used bacon fat) in the pan so that it forms a thin coating over the bottom. Add the grated sweet potato and salt to taste. Cook until the sweet potatoes are tender, but not mushy (about 6-8 minutes). Add the spinach and cook until it turns dark green (a few minutes). Taste for salt, and adjust as needed. Spread the sweet potato-spinach mixture evenly on on the bottom of the pan. Add the eggs so that they evenly cover the veggies. Cook for a couple of minutes on the stovetop and then transfer to the oven (middle rack). Broil on high for 5-7 minutes or until the frittata is set and cooked through. Remove from the oven and let it sit for a minute or two before slicing into eight pie pieces. Eat one or two…or more! Refrigerate the rest and reheat in a hot pan for tomorrow’s breakfast or a snack. This recipe is 21DSD-friendly for those doing the athlete, pregnant, or breastfeeding modifications. 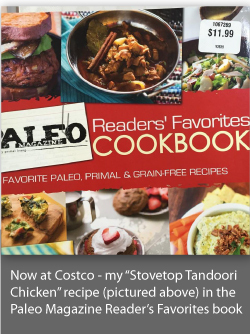 This post is linked to Tasty Traditions, Real Food Wednesday and Party Wave Wednesday. That looks yummy. I will have to trying that soon. Wow. Coming up on a Sunday brunch near me. Thanks! I made this for Sunday brunch and it was a big hit. I am researching recipes for when we open our B&B, and this made the list. Thanks!! Glad you liked it! 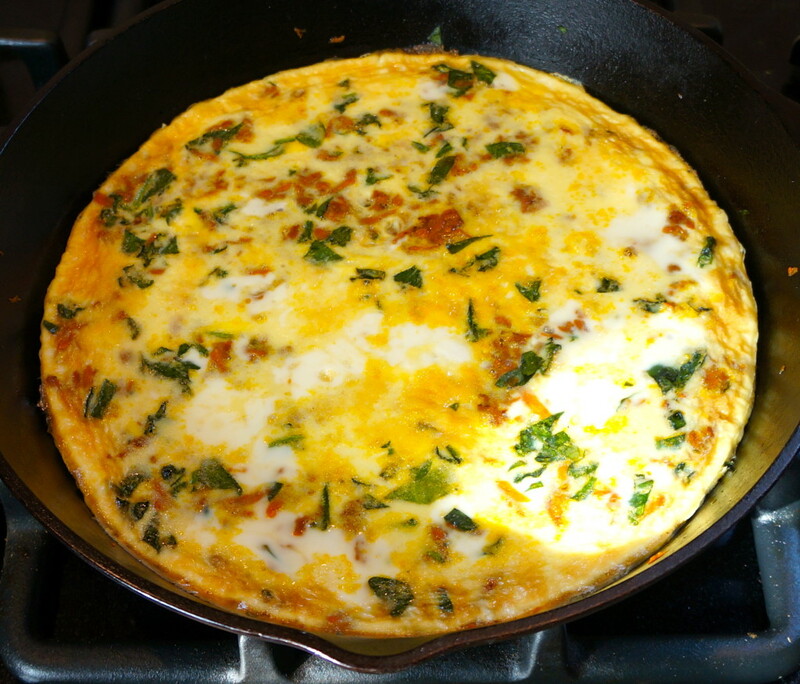 You should try this one, too–http://halfindiancook.com/asparagus-bacon-frittata/. Glad you liked it! And the spicy sausage sounds good, too!